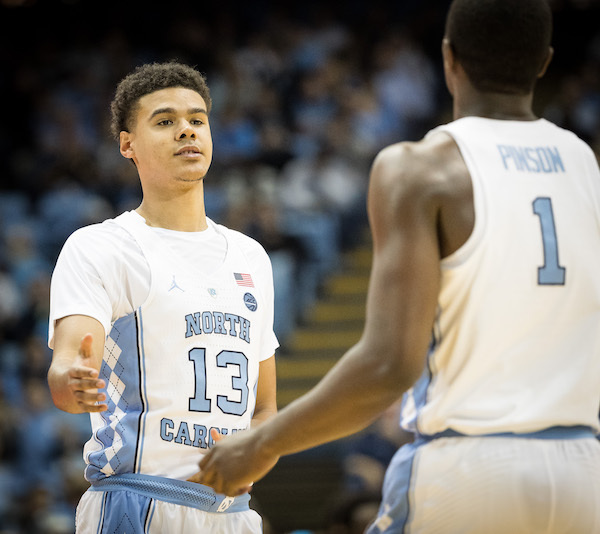 With the return of Cam Johnson, hushes and whispers of UNC small-ball aren't hard to hear in Chapel Hill. Luke Maye playing the center, forcing opposing big men to guard the perimeter. The six-foot-eight-inch Cam Johnson and the versatile Theo Pinson creating a small-forward duo role. The charge-drawing and effort-minded Kenny Williams drilling shot after shot. Oh, and the ultra-decorated Joel Berry II running this offense. Not so fast, said Roy Williams in his Friday morning press conference. "I want our inside scoring to get better," Williams said. "There's two ways to get it: by your big guys or by your guards penetrating to the basket and being able to score." Throughout the season, the latter has been the case, as UNC's post play has often steered itself into trouble. "The way I like to coach - the way I like to have things happens - we've always have had great balance," Williams said. "When we had Tyler Hansbrough, we had a guy named (Wayne) Ellington and Danny Green who could shoot the ball too." Williams will likely take a "wait-and-see" approach to calling out his lineups, gaining a feel for his team as the season progresses, he said. "We could make lineups all day long and play strengths and weaknesses..." he said. "There's more than one way to skin a cat." "Kevin Durant, Steph Curry, Klay Thompson, Draymond Green - if I had those four guys shooting the ball, the center probably wouldn't get many opportunities," he said. "I still want to be balanced, and I still believe in the bottom of my soul that the most important thing is getting the ball inside." While UNC looks to improve its interior game, it will look to create a little more balance by finally adding Johnson into the mix. After a dramatic graduate-transfer process, Johnson suffered a couple of injuries, leaving him sidelined for nearly the entirety of non-conference play. Johnson complimented his teammates' ability to work him back into the lineup. "I think everybody on this team plays a big part in making people feel comfortable on the court. Joel and Theo have helped me a large part in transitioning back into the flow of the game, but it also goes out to everybody else - Luke, Kenny, Garrison, Sterling, Jalek, everybody, B-Rob, Platek - they all help a lot with transitioning back." Maye praised Johnson, who lives with him and fellow junior Kenny Williams. "It's just been great to kind of bond with him. He comes from a similar background. He's got three brothers and [he's] a really big family guy," Maye said. "It's really cool to have him healthy, finally." While Maye noted Johnson's stroke from deep and knack for getting to the free throw line, he made sure to mention the extra dimension the Pennsylvania native will bring to the floor. "With Cam being able to stretch the floor and Theo making so many great plays, it's going to be really exciting to see how we can flow together," he said. "I'm really excited to see where he goes from here." Expectations for a Carolina team riddled with inconsistencies aren't certain at this point. A big-time win against Tennessee, a dismal shooting performance in a loss against Michigan State, historically great shooting from the perimeter and a mind-boggling loss to Wofford in the Smith Center all characterize the roller coaster season. The Tar Heels' early conference schedule will provide them the opportunity to prove themselves and set some expectations. After hosting Wake, UNC will travel to No. 24 Florida State and to No. 9 Virginia. A home game against Boston College could catch Carolina off guard as they look ahead to a Saturday evening matchup with Notre Dame in South Bend, Indiana. For better or for worse, the balance the Tar Heels find in the next five games ought to tell fans a little more about the defending champs. The Shot will never be forgotten, yet Luke Maye is giving fans a reason to remember the shooter.